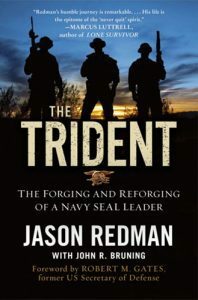 Highly decorated former Navy SEAL, Jason Redman discusses his military career and his best selling book, ”The Trident.” Jason signed copies of his book following the event, and he was the special guest of President of Embry-Riddle, John P. Johnson, at the Veterans Appreciation Day ceremonies on April 15th, 2014. Karl Rove’s Wall Street Journal article tells a story of heroism and endurance – the story of Jason Redman. 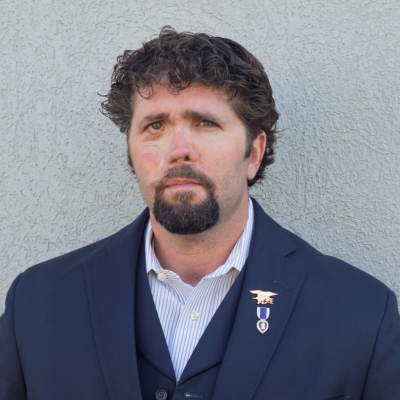 After 21 years of service, Navy SEAL Jason Redman was shot eight times in Fallujah. Redman wrote, “The wounds I received, I got in a job I love, doing it for people I love, supporting the freedom of a country I deeply love.” Redman says he is incredibly tough and will have a full recovery. Investor’s Business Daily writer, Curt Schleier, wrote an article for Investors.com about how Jason Redman maintained a positive attitude throughout his recovery as a wounded veteran. Jason Redman took no prisoners with the note he posted on the door of his hospital room. Redman shed his anger to help other wounded veterans. Riddled with gunshot wounds in a 2007 firefight, Redman somehow continued to maintain a positive attitude.